Adventures in Mommy-hood: Chick day and our "mother hen"
Y'all! We're picking up our chicks today! Bubby's skipping school--I sent a note to his teacher that read, "[Bubby] won't be in school on Wednesday because he will be picking up chicks. Baby chickens, that is..."
Since we don't have them yet, I thought I'd show you how the coop is progressing, and a few pics of the empty brooder, as well as explain the whole press-n-seal thing. 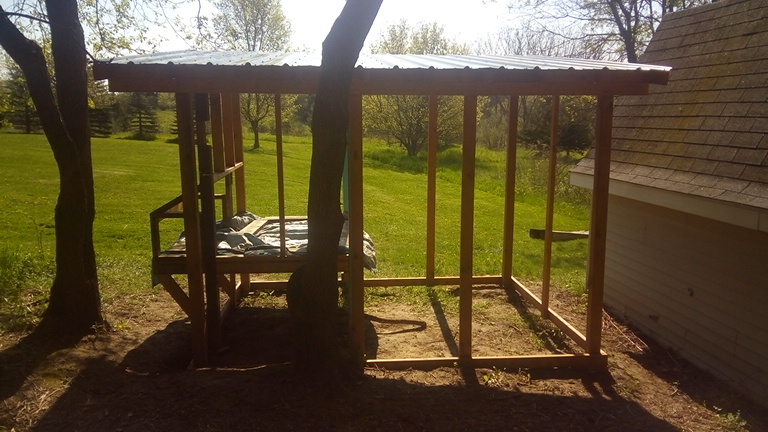 So on the weekend, we were able to work on both AKD's Eagle project and on the coop. Actually, during most of the Eagle project work, I was lazing about down by the river, throwing rocks in (I told the boys I had to go to the bathroom, which was true, but then I got...distracted...by the river). Normally, I like to limit the number of rocks I throw into rivers, being concerned about erosion and such, but since this river is soon to be at the bottom of a lake, along with all of the rocks and the river bank, I don't feel bad at all. Throw 'em all in there, I say. It was a lovely day, and only one of us got muddy. Sunday was dedicated to the chicken coop. We got the roof on, and suddenly it seems like it's almost done--even though in reality, there's still a lot of work to be done. MC rocked as Sawblock's helper for most of the day. He's quite a bit taller than me now, you know, which helped a lot. 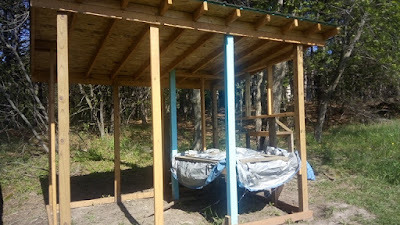 Bubby and I also did a lot of staining, including staining all of the remaining lumber...on the ground. So. Much. Easier. on the ground than in situ. Bubby and I set up the brooder last Thursday and Friday. It's a big cardboard box set on top of one of our bathtubs. 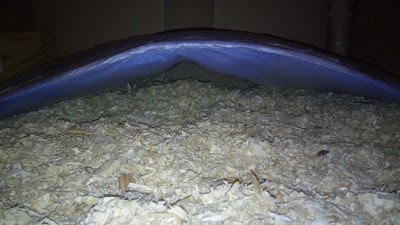 I lined the bottom with puppy training pads ($1 for 3 at the dollar store), and we put about 2 inches of pine shavings on top. 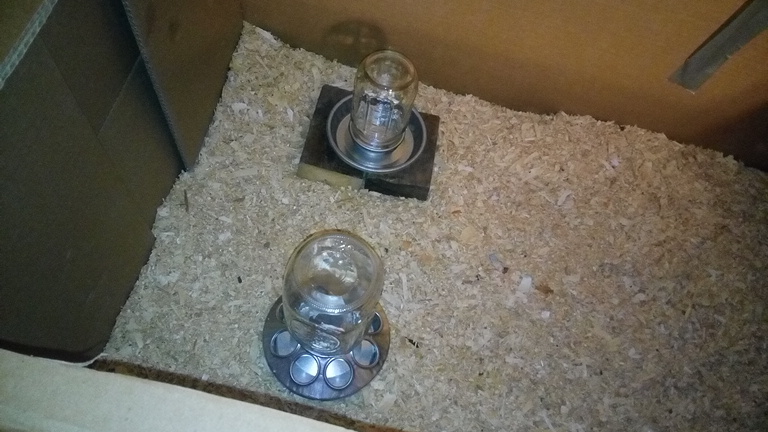 Bubby carefully placed the feeder and waterer in the brooder, putting the waterer up on blocks to hopefully keep the shavings out of the water. 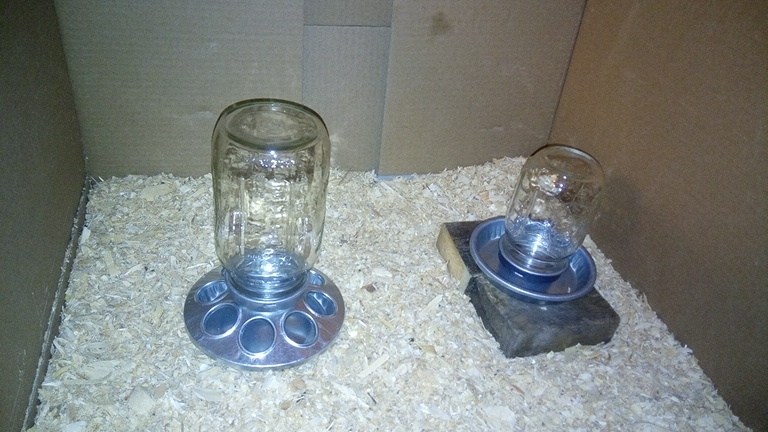 We did borrow a feeder and waterer from some of our chicken friends, but they were pretty big for the space, and given my obsession with jars, I think these are more appropriate. Originally, I attached quart sized jars to both the feeder and the waterer, but I decided to go with a smaller, pint-sized jar for the water, so if the babies tip it over, there's less water to spill. The lower center of gravity makes it less likely to tip over as well. The other thing one needs for baby chickens is heat. The babies need temps of 90-95°F in the first week, with gradually reducing temps in subsequent weeks until they're able to regulate their own temperatures. To accomplish this, most people use a heat lamp, but I decided to go another way. I'm using a heating pad. The idea is to form a little cave for the chicks to huddle under. If they had a mama, this is the way she would keep her babies warm, by huddling them under her body. I cut a piece of metal garden fencing to fit our heating pad, and placed it between the pad and its removable fabric cover to serve as a frame. Then I sewed the cover shut, and I covered the whole thing with Glad press-n-seal (that's to keep the poop off our heating pad--and by the way, press-n-seal is BPA-free). I'm using empty toilet paper tubes to protect the cord from pecking. As the babies grow, I will bend the fencing to make the cave higher so the chicks will still fit. 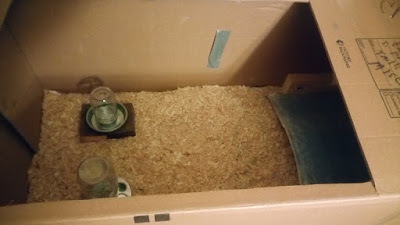 I'm using the 2x4 on the side to restrict the space and to keep the heating pad from collapsing if the babies decide to jump up and down on it. As the height of the cave increases, the width will decrease, so I'll add more 2x4s to the side as needed. Now, you may be thinking to yourself, but what about fire? Is it safe to place a heat source directly into combustible materials like that? Consider this: heating pads for home use are required, by law, to only reach temperatures up to 176°F, and in fact, the highest temperature my heating pad reaches is 140°F. 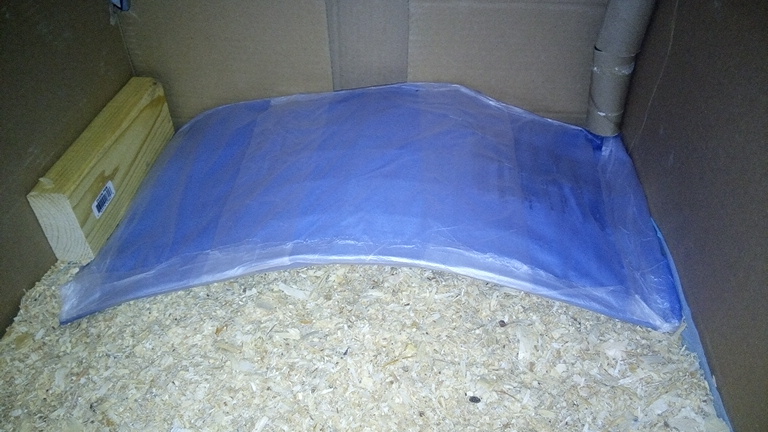 In the brooder, my heating pad will not be warmer than 100°F. Wood burns at a temperature of well over 450°F, so using a heating pad in the brooder is actually quite safe. The chicks will stay in the brooder until it's warm enough for them to be outside, which we're anticipating will be mid to late June. As they get a little bigger we'll add a few enrichment items to the brooder, like perches and dirt (for grit). We also have a window screen handy to place over the top if they start hopping high enough to escape. We are so excited for our chickens. Stay tuned--next post, I'm sure we'll have pictures!